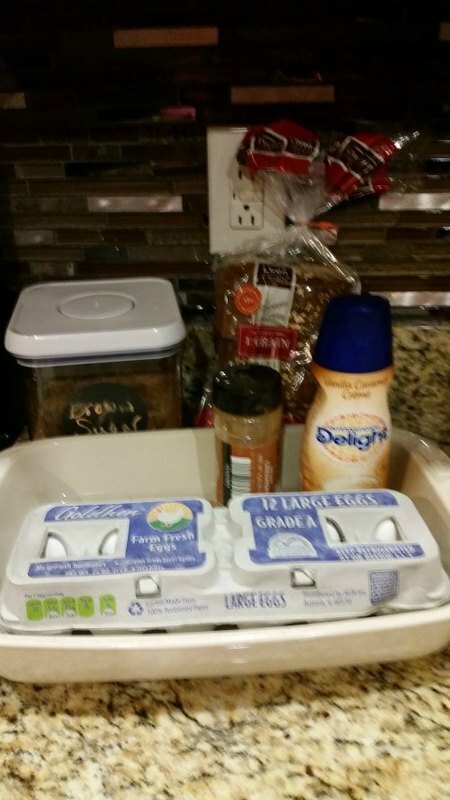 My youngest daughter has been begging me to make my Overnight French Toast recipe. It is such a fun treat for the kids in the morning, which makes it a great way to kick off the school week. 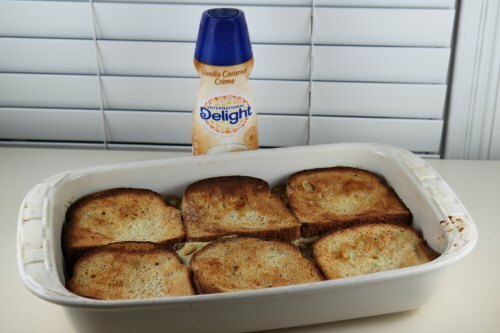 It is also super easy to bake, even easier when you use International Delight creamers. This is a great recipe to make if you have bread that needs to be used up. I normally just use regular bread slices. Sometimes, I use the Texas Toast bread, which works out nice since it is thicker. 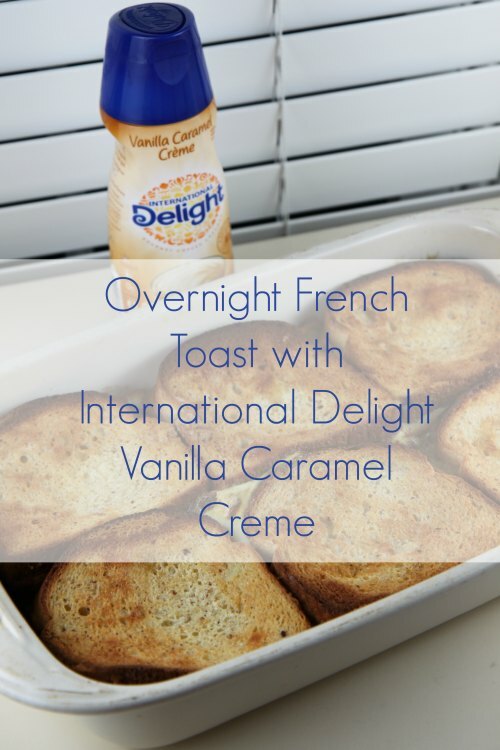 You can also use any International Delight creamer that you have on hand depending on your flavor preferences. There are so many options to choose from that you are sure to find one that you like. Prepare the night before by combining the creamer, eggs, brown sugar, and cinnamon in a bowl. Spray your 9″x11″ baking dish with cooking spray. Add two layers of bread, which should be eight slices. Pour the egg mixture over the bread. Store overnight in your refrigerator, covered tightly. You want to place the saran wrap tightly right over the bread so it really soaks up the mixture. Next morning, preheat oven to 375 degrees. Remove saran wrap and top with pats of butter. Cook for 40-50 minutes until done. I overcooked this batch a little but the kids didn’t seem to mind. Top with syrup. Serve immediately. Sign up for Member Delights and have access to coupons, giveaways, new recipes, and more each month. Stay up to date on the latest International Delight news on Facebook, Twitter,Instagram, or Pinterest. Prepare the night before by combining the creamer, eggs, brown sugar, and cinnamon in a bowl. Spray your 9"x11" baking dish with cooking spray. Add two layers of bread, which should be eight slices. Pour the egg mixture over the bread. Store overnight in your refrigerator, covered tightly. 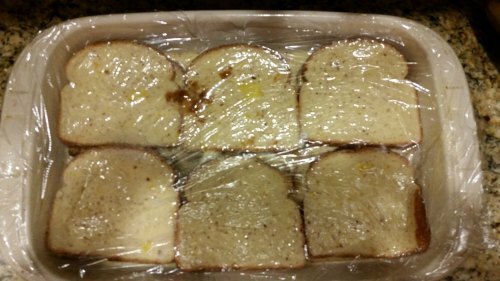 You want to place the saran wrap tightly right over the bread so it really soaks up the mixture. Next morning, preheat oven to 375 degrees. Remove saran wrap and top with pats of butter. Cook for 40-50 minutes until done. I overcooked this batch a little but the kids didn't seem to mind. Top with syrup. Serve immediately.